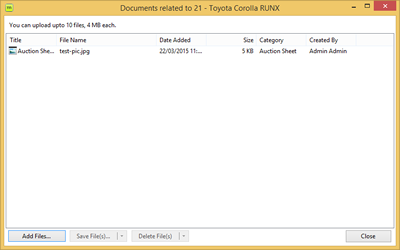 The Document Manager module is a feature of the Motorcentral DMS that allows files (such as papers, images, videos etc) to be stored against a vehicle, sale or contact. This allows one handy location for all your important items related to a particular entity. Adding and removing from a document library is easy and Motorcentral manages the entire process. You simply need to upload file(s) from your device, label them and Motorcentral will automatically record the date they were added as well as store them. If you simply wish to store a document that is not related to a particular vehicle, sale or contract (eg. Legal Documents, Yard Photos etc), you can elect to save these in your Dealerships Document Library instead.